A Rad Mobile deluxe cabinet behind an After Burner cabinet. Rad Mobile[a] is a racing arcade game developed and published by Sega. 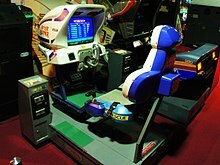 This game was first released in arcades in January 1991, then ported to the Sega Saturn in December 1994 under the name Gale Racer. [b] Rad Mobile was Sega's first 32-bit game, utilizing Sega's System 32 arcade system board. The game was also the first appearance of Sonic the Hedgehog, appearing as an ornament hanging from the driver's rearview mirror, five months before his debut in 1991's Sonic the Hedgehog. Rad Mobile received mixed reviews after its launch, praising its 3D visuals but criticizing its gameplay. Gameplay screenshot showing the 32-bit sprite graphics of the game. Sonic the Hedgehog makes his first appearance, hanging above the rear view mirror. Similar to Out Run, the concept behind Rad Mobile is a race against opponents across the United States. 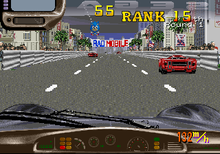 Players must race across the country while also avoiding police cars. At certain points in the race, the road forks, allowing players to skip several stages. The game's weather and time of day changes, sometimes requiring players to turn on windshield wipers or headlights. Rad Mobile was also the first appearance of Sonic the Hedgehog, appearing as a decorative item hanging from the driver's rearview mirror. Sonic's appearance in the game predated his debut in Sonic the Hedgehog for the Sega Genesis by five months. Interested in getting their new character visible to the public, Sonic Team approved of his appearance in the game. Credit for developing the game is usually given to Yu Suzuki and his Sega AM2 division, the developers of Out Run, which established the formula of Rad Mobile's gameplay. However, Suzuki has not listed it in any of his official lists of works. Zach Whalen, an associate professor with the University of Mary Washington, located a segment of text in the game's source code suggesting that Sega AM3 was the actual developer of the game. In a 1991 interview, AM3 head Hisao Oguchi made mention of AM3's involvement in Rad Mobile's development. Sega's AM4 division, at the time a designer of arcade cabinets, had involvement with constructing the game's deluxe cabinet that would bank and turn, and featured functioning brake lights, while the game was also released in an upright cabinet. Rad Mobile was Sega's debut of its System 32 arcade system board, Sega's last arcade board to utilize sprites in place of 3D polygons. The game premiered at the Amusement Trade Exhibition in the United Kingdom in January 1991, alongside Sega's R-360 cabinet. Its release was in February 1991. At the time of its release, Rad Mobile was generally praised for its graphics but criticized for its gameplay. Sinclair User stated that Sega "concentrated on the technology and forgot about the gameplay". Reviewer John Cook called the gameplay "dull" and stated there was little to do in the game other than stare at the visuals. Computer and Video Games gave a review stating that the game is "technically superb" and has "exceptionally realistic 3D" but lacks anything to stimulate addictive gameplay. In a March 1991 review, Ace described Rad Mobile as "high on visuals and low on gameplay". Beep! MegaDrive praised the way the car used the windshield wiper in the rain, and headlights at night. Retrospectively, video game journalist Ken Horowitz has stated that Rad Mobile has struggled to be recognized as an influential racing game, though he reinforces that the game deserves at least some recognition as Sega's first 32-bit racing game and as the first appearance of Sonic the Hedgehog. Martin Dodd of Retro Gamer compared the game's graphics to Power Drift and called the game "very good for the time with it being 32-bit". In 1994 a port of Rad Mobile was released only in Japan for the Sega Saturn, as Gale Racer. Its release was much later than the arcade version due to the Genesis' hardware being insufficient to play the game. Gale Racer was directed by Tomohiro Kondo, who had worked on the Panzer Dragoon series, and designed by Takashi Yuda, responsible for the design of The Revenge of Shinobi. As part of the port, designs of the cars were changed to polygons in place of the original sprites. Gale Racer received a negative reception, with Horowitz stating that based on the talent behind the Saturn port, "one would have expected nothing short of the best home racing game ever made." On release, Sega Saturn Tsūshin scored the game a 24 out of 40. Computer and Video Games detested Gale Racer, criticizing the gameplay, visuals, and hypothesizing that it was rushed out to shelves to tie in with the Saturn's release. ^ Japanese: ラッドモビール, Hepburn: Raddo mobīru? ^ Japanese: ゲイルレーサー, Hepburn: Geiru reisā? ^ a b Dodd, Martin (October 31, 2008). "Rad Mobile". Retro Gamer. Imagine Publishing. Retrieved January 18, 2019. ^ a b c d e f g Horowitz, Ken (2018). The Sega Arcade Revolution, A History in 62 Games. McFarland & Company. pp. 182–184. ISBN 9781476631967. ^ "Sega Art Development Confidential". Beep! MegaDrive (in Japanese). SoftBank Group. April 1991. p. 123. ^ Uki, Suzi (May 1991). "Hot Slots". Raze. No. 7. Newsfield. p. 71. ISSN 0960-7706. ^ a b Cook, John (March 1991). "Coin Ops". Sinclair User. EMAP. pp. 54–55. ISSN 0262-5458. ^ a b "Rad Mobile". Beep! MegaDrive (in Japanese). SoftBank Group. May 1991. p. 127. ^ Jaz (March 1991). "Jazza's Arcade Action". Computer and Video Games. Future Publishing. pp. 96–97. ISSN 0261-3697. ^ "Gale Racer". GamePro. No. 68. IDG. March 1995. p. 34. Retrieved 2018-11-14. ^ SegaSaturn GameCross Review: ゲイルレーサー. Sega Saturn Tsūshin. No.1. Pg.7. 2 December 1994. ^ "Gale Racer". Computer and Video Games. No. 159. February 1995. p. 34.